I return today to the subject of the class of reptiles properly described as dawn age reptiles. My researches have stumbled into more telling reports and the phenomenon is sorting itself out. We can begin to characterize the phenomena a lot better. Modern sightings exist for creatures that are apparently Theropods, Sauropods, Apatosaurus, Plesiosaurs, Stegosaurs and possibly Pterosaurs. I suspect that we haven’t missed a species at this rate. These are all creatures that are large specialized reptiles, yet on the same class as the turtle and the crocodile. They are not warm blooded. What that means is that they are all aquatic and generally unable to operate too far from a body of water. Yet this alone gives them a huge range. The plesiosaur is able to operate through out the ocean and we can assume into the Arctic. It merely needs to increase the antifreeze capability of its blood system to do this as is done by most northern fish. The remainder needs to operate on land or most properly within large deltaic swamps. Again, up to 13,000 years ago, we had flat lying continental shelf that most certainly was primarily swamp land not unlike the Gulf coast. Today we have the tropical swamps of the Congo and the Amazon and many smaller locales. Again these swamps maintain a steady ambient temperature necessary for these creature’s survival and success. Thus the only places to look for dawn age reptiles are were other dawn age reptiles survive. On land it is specifically crocodile swamps throughout the tropics. At sea, it is the whole ocean and from the available observations inland lakes also as breeding locales. This makes good sense since an egg clutch does not do well at sea. These reptiles exhibit two other important characteristics that have hidden them from us. The easy one is that they are generally nocturnal. They simply risk getting too hot if they start charging around in the midday sun. Thus after any exposure they head for deep water and reserve activity for the night and predawn hours. They have been observed quietly sunbathing but this is not a source of energy. Recall that sunbathing crocodiles on been disturbed go straight to water. The second is that like fish, they are able to get enough oxygen in water to operate comfortably. It appears that the mechanism is a form of fleshy comb, not unlike a rooster’s comb. Their lungs are used for exertion but on sliding to the bottom of a pool, they simply go doggo and absorb oxygen from the water itself with their external gill like surfaces. 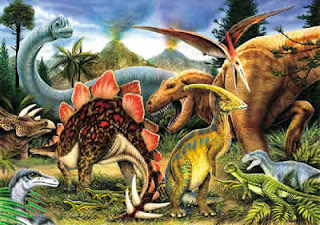 Both the Stegosaur and the Theropod have been depicted with fleshy combs and the Sauropod observed in Africa was also sporting a form of fleshy comb. Ongoing sightings of Plesiosaur like creatures in over thirty lakes in the Pacific Northwest have also depicted a comb around it head. None of this would have easily survived the fossil record but it is been consistently reported in the many scattered sightings. As I have posted earlier, these animals all live where man decidedly does not live. You do not set up housekeeping in a crocodile infested swamp. Yet we have a group of reptiles feeding on the soft swamp plant life and each other. As I posted earlier, T-Rex is perfectly engineered to kill and eat a crocodile. The challenge for the future is to capture some of these animals. Up to about fifteen years ago, all sightings ended up, at best in the hands of a newspaper reporter, and I must say that many did their very best in dealing first with the informant and then in getting the story straight. If it went any further it went into the hands of a professor somewhere who had few credentials to handle the observations and simply died there. In fact the average newspaper man might only see one story in his lifetime. An exception to this was John Green who assembled a book on Sasquatch reports because he actually got enough in to inspire the effort in the first place. This did not happen so easily with giant reptiles. This has now changed. Reports are been posted on the Internet and we are slowly getting critical mass that any competent researcher can access. This is accelerating the effort to locate and discover specimens. For all of them you need to pack a harpoon gun, so it will be a while yet and the pictures will remain fuzzy and shaky as the photographer discovers adrenalin. One annoying aspect of the presently available material is that the anti evolution crowd has jumped onto the subject as if it might prove their case, an argument which escapes me entirely, but then their arguments usually do. That the early products of evolution remain with us is a pleasant surprise and is solely the result of the conservation of their ecological niche. At least I am reassured that if we preserve our own niche that mankind has a long future lasting millions of years on Earth and possibly as many on Venus once we get around to setting the place up properly. This item is confirmation of sightings across the strait from Northern Australia that was strongly inferred by the Burrunjor we posted on earlier. A dinosaur actually living in the world today? According to a report in Papua New Guinea's The Independent newspaper,1 a 'dinosaur-like reptile' was seen on two occasions in the Lake Murray area, in Western Province. On December 11, 1999, villagers travelling in a canoe reported seeing the creature wading in shallow water near Boboa. The following day, a Seventh Day Adventist pastor and a church elder say they saw the animal not far from the first sighting. So what did these eyewitnesses really see? The description does not seem to fit any species known to live on the earth today. However, its large size and crocodile-like skin certainly bring images of dinosaurs powerfully to mind. For believers in the prevailing evolutionary view that dinosaurs died out 65 million years ago, the idea that they might be alive today is hard to accept. This is despite the recent discovery of the living Wollemi pine tree,3 also believed, from fossils, to have been extinct since the 'dinosaur age'. Christians, however, should not be surprised, as the Bible teaches that God created the dinosaurs only thousands of years ago. So why have dinosaurs (apparently) disappeared? Probably for the very same reasons that wildlife protection agencies give when expressing concern over current extinction rates of animals and plants,4 primarily the effect of man (e.g. through hunting and land clearing). Genesis 8:17) more quickly than Noah's descendants (e.g. a rabbit's pregnancy lasts 31 days; the offspring mature in ten weeks). N.B. also that the people disobediently stayed around Babel, before God judged them. As human settlement expanded, populations of many animal species would have declined due to over-exploitation (for meat, skins, etc. ), habitat loss, or deliberate extermination to reduce the threat of attack. Tales of dragon-slaying heroes like St George may suggest man's part in the dinosaurs' demise. Despite the popular view that such factors have the most impact on amphibians (e.g. frogs), many scientists now recognise that reptiles are in even greater danger of extinction.5 This may help to explain why the celebrated dinosaurs have apparently died out before many of our so-called 'modern' species. So if any dinosaur species are still living, the most likely places to find them would be in biologically rich areas with limited or no human settlement, such as the Congo and Lake Murray regions, as these reports suggest.